As we mentioned in past weekly newsletters, our school Action Plan for Learning is focused on improving literacy and self-awareness (using the Zones of Regulation materials) for all our students. Part of this learning and instruction is centered around students being able to identify the zone they are in (green, yellow, blue or red) and to use strategies to return to the green zone (which is calm, focused and ready for learning). 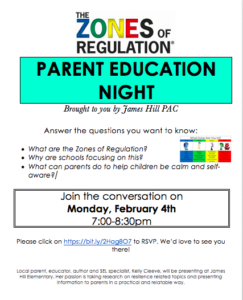 To learn more in-depth information on the Zones of Regulation and how you can support at home, our amazing PAC is hosting a Parent Education Night on Monday, February 4, 7-8:30 pm! 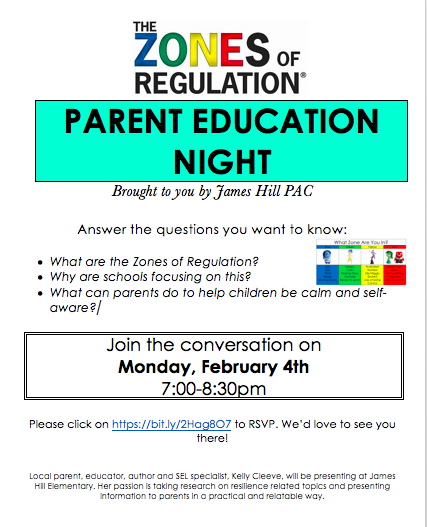 This evening is dedicated to teaching families how they can use the Zones of Regulation at home with their child(ren) to remain consistent with the school’s teachings, but also to give family members effective tools to help children with self-regulation both at home and in the community. You can register here: https://bit.ly/2Hag8O7 for our Parent Education Night or please see the poster here for more information: Parent Education Night SR 2019. Vancouver Giants vs. Kelowna game this Sunday! Reminder to those of you purchased our fundraiser tickets to the Vancouver Giants game this Sunday, January 27! The game starts at 4:00 pm. We have a large number of James Hill families and friends attending- be sure to show your James Hill spirit at the game! Just a reminder to please refrain from double parking in the drive through area of the parking lot. We are finding that some vehicles are left vacant and are blocking others. Also, please ensure your full attention is on the road as there are many families and children walking through the lot- please do not text and drive. Thank you for your help in keeping our students safe! All children who will be five years old by December 31 in the current calendar year are eligible for the Kindergarten program beginning September 5, 2019. 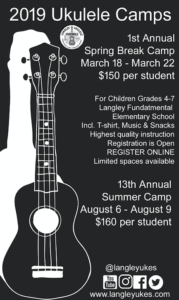 Registrations received after 12 noon on April 1, 2019 will be considered late. Late registration may affect placement in your catchment school due to space limitations. Proof of residence (Driver’s License, utility bill, mortgage statement). Regarding school text message in the Remind App: There will be no service disruption for anyone on the Bell network. Bell customers will continue to receive text messages. Unfortunately, text notifications will still be ending on Monday, January 28 for anyone with Rogers Canada or its subsidiaries. To continue receiving Remind messages, they’ll need to download the mobile app orenable email notifications, both of which are free to use. Parent Education Night Monday, February 4th, 7:00pm – 8:30pm @ James Hill Elementary in the Gym. Please join us for this FREE seminar with Kelly Cleeve, local parent, educator, author and SEL Specialist on Zones of Regulation. What are they? Why are schools focusing on this? What can parents do to help children be calm and more self aware? We need 50+ volunteers to help run this fantastic event. Please come help! Tickets & Pre-order forms for Pizza coming home soon. When you shop at the M&M Food Market in Langley, be sure to reference James Hill Elementary at the checkout. 5% of your sale gets donated directly to James Hill Elementary!!!! This will go on until the end of the school year.